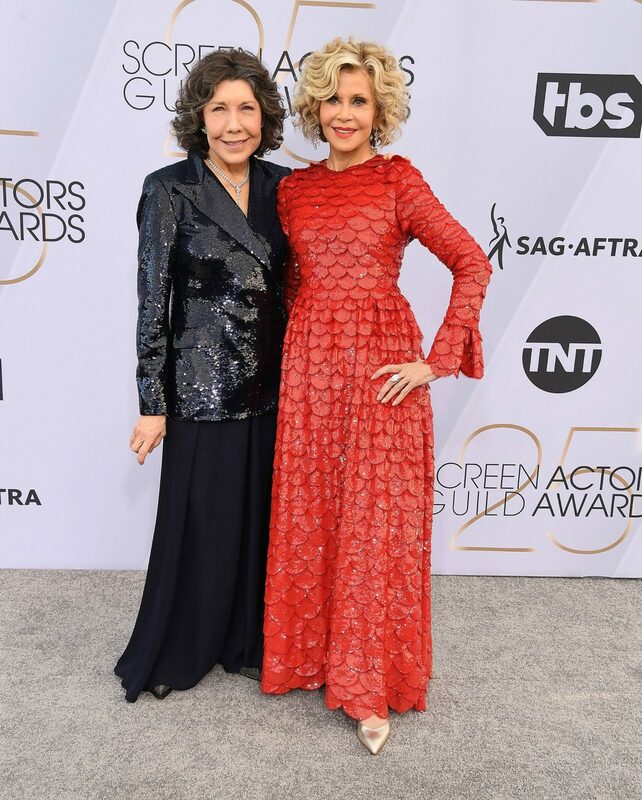 Grace and Frankie stars Jane Fonda and Lily Tomlin turned on the sparkle factor as they stepped out for an awards dinner this week. 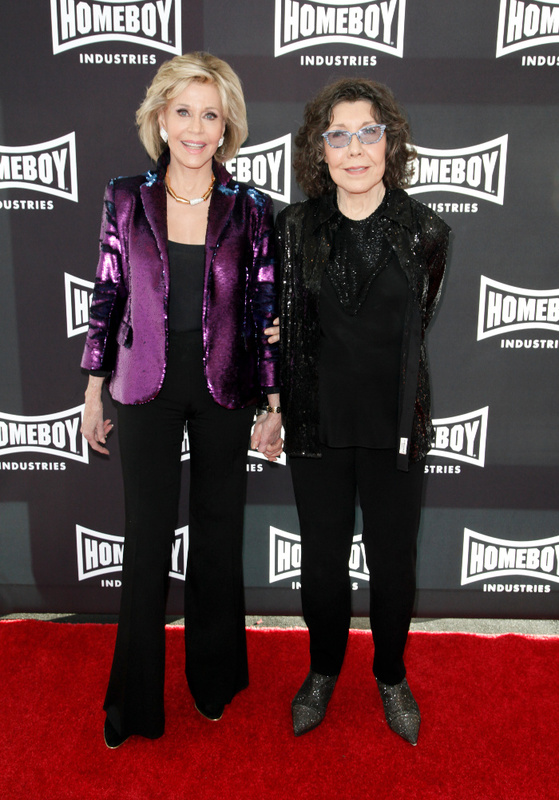 The two talented actresses looked gorgeous in shiny ensembles for the Homeboy Industries event in Los Angeles on Saturday. Jane, 81, made a bold statement in a shiny purple jacket which she paired with a simple black top and black flared pants. Meanwhile, Lily, 79, was all smiles as she posed for photos alongside her co-star in a sparkly black long-sleeved top, black pants, and to add a bit more pizzazz, a pair of glittery shoes. The two certainly stood out from the crowd at the Lo Máximo Awards Dinner, where they celebrated the achievements of those who have gone out of their way to help others. Jane and Lily were the hosts for the night of compassion and joy. It was the second outing for the pair in a matter of weeks, having been spotted out and about mid-March at the PaleyFest in California. Jane looked glamorous in a fashionable ensemble which included a stylish pair of wide-leg pants and a polka dot top. She teamed the show-stopping look with a pair of pointy black boots and a matching necklace. The actress looked every inch the star as she posed for photos at the event, her beautiful features highlighted with a soft pink lip, swipe of blush and lashings of dark mascara. .
Lily looked equally stylish in black pants and a vibrant purple blouse. Opting for full comfort, the 79-year-old actress added black sneakers to the ensemble, and proved a complete natural as she posed alongside her glamorous pal. Prior to this the two hit the red carpet at the SAG Awards. Jane kept her style elegant, opting for a red sequinned Valentino gown with bell sleeves. Lily on the other hand chose a long floor-length skirt paired with a black sequinned blazer for the event. The star teamed her outfit with a pair of black pointed heels and accessorised with simple silver jewellery. Jane and Lily were both nominated for SAG Awards for Outstanding Performance by a Female Actor in a Comedy Series. 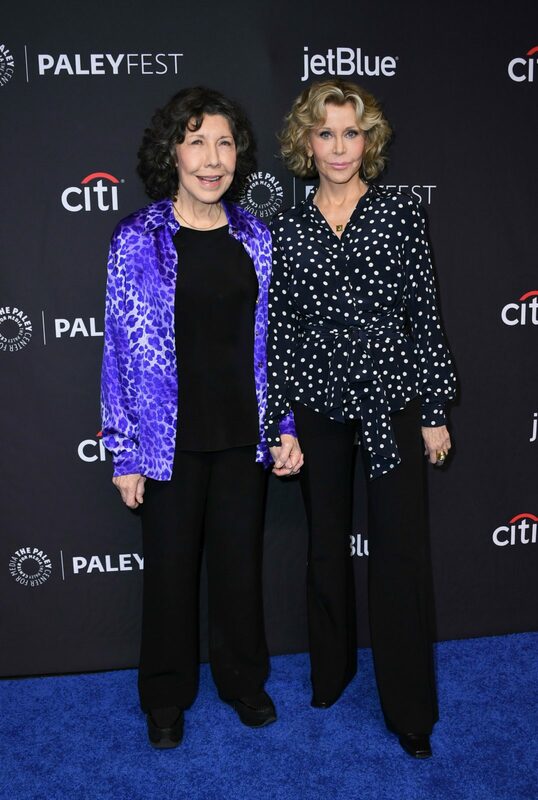 Are you a fan of Jane Fonda and Lily Tomlin? Do you enjoy watching Grace and Frankie?